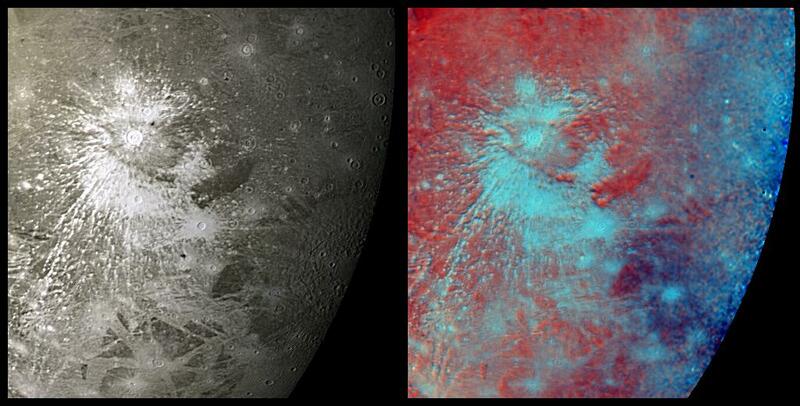 This mosaic of Voyager 2 images taken July 9, 1979, shows a prominent rayed crater on Jupiter's icy moon, Ganymede. 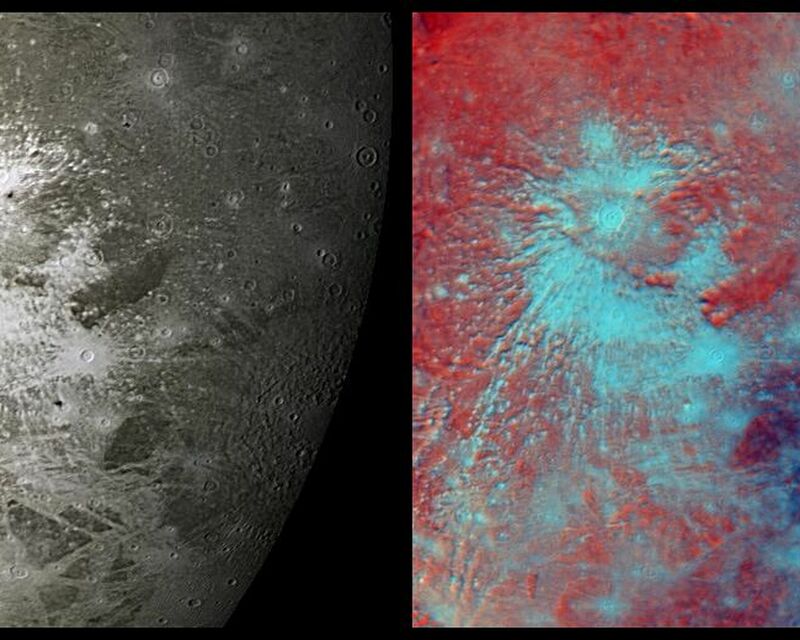 The view on the left is a monochrome image, and that on the right is the same scene shown in false color designed to accentuate the icy ejecta rays splashed out by the impact. This crater is about 150 km (93 miles) across. Like several other large craters in this scene, the rayed one has a central pit, whose origins remain speculative but may involve impact melting or solid-state fluidization of the icy crust. 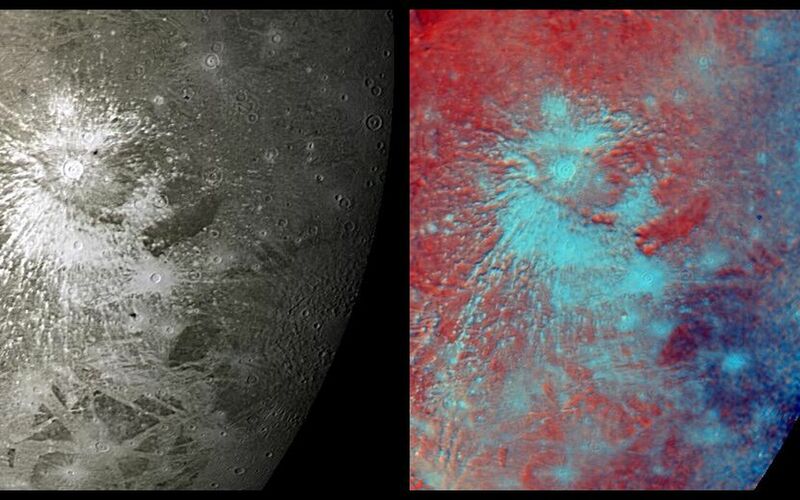 Bright crater rays on Ganymede, like those on our own Moon, are useful to geologists because they constitute a set of features that were laid across the moon's surface at a discrete point in time--thus they serve as time markers that can be used to establish the sequence of events that shaped Ganymede's surface. For instance, the crater rays appear to be painted over, hence are younger than, areas of grooved terrain (lower left quadrant), whereas a somewhat smaller crater at the center of the scene has icy ejecta that appears to bury (hence, post-dates) the large crater ray system. 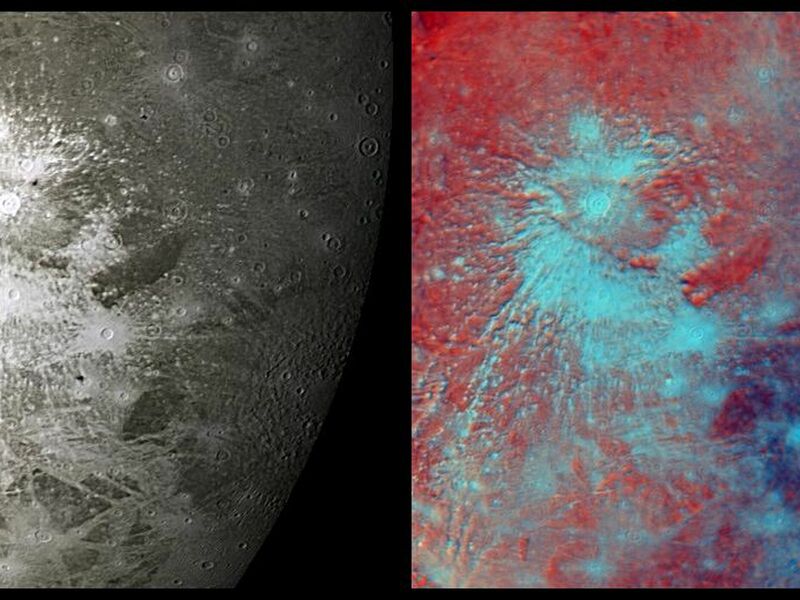 One can conclude that the grooved terrain formed first, then the large crater and its rays, and then the smaller crater and its fresh icy ejecta deposits.